Le Micro-Sérum de Rose Yeux helps recharge the skin with rose micro-nutrients essential to energizing the eye area. In a feat of engineering, its strikingly fresh applicator is set with 10 rotating ceramic micro-beads. Instantly, puffiness and dark circles appear to fade away. After 4 weeks, the eye contour appears rested and illuminated. Enriched with Rose de Granville fruit, this micro-nutritive gel-serum dramatically illuminates the eyes. Puffiness and dark circles fade away, revealing bright, visibly rested eyes beaming with freshness. The skin of the eye contour is strengthened, nourished and energized. The Rose de Granville, jewel of Dior Prestige, blooms in the Loire valley, a land selected for its extreme purity and mineral wealth. Like the original wild flower, it knows how to draw on all the resources on offer in its environment. This heritage allows it to synthesize all the organic compounds it needs to nourish its resilience and beauty. Thanks to a pioneering phytochemical analysis, Dior Science identified a genuine treasure at the heart of the flower: its precious micro-nutrients essential to the skin's strength and beauty. Its next-generation texture combines the striking freshness of a gel with the power of a serum. Upon contact with the skin, it induces an immediate feeling of intense, beneficial freshness: the temperature of the eye contour is lowered by 2.3°C. * Lightweight and evanescent, Le Micro-Sérum de Rose Yeux instantly delights the senses and provides immediate visual satisfaction: dark circles are visibly diminished and the eye contour is instantly illuminated and smoothed. * Clinical Test - 11 volunteers - instrumental measurements. Le Micro-Sérum de Rose Yeux combines the benefits of the Rose de Granville fruit and an extraordinary micro-nutritional richness. The Rose fruit, a true high-energy concentrate, contains 22 micro-nutrients, necessary for fatigued eye contours. The eyes appear brighter, more open and visibly rested. * Clinical test ‑ 32 women ‑ evaluation by an independent dermatologist: 2 applications/day for 4 weeks. 1. Decongest. Press on the tube to get a drop of Le Micro-Serum de Rose Yeux. With your eyes closed, smooth along the lower eyelid in a back-and-forth motion, moving from the temple to the inner corner of the eye. The formula’s freshness combined with 10 ceramic micro-beads helps decongest signs of puffiness and dark circles. 2. Revive and soothe. Place the Le Micro-Sérum de Rose Yeux applicator on the inner corner of the eye and press gently. Glide the applicator along the upper eyelid as you enjoy its soothing and refreshing effect. Then glide it over the temple in a circular motion. Repeat this step three times. 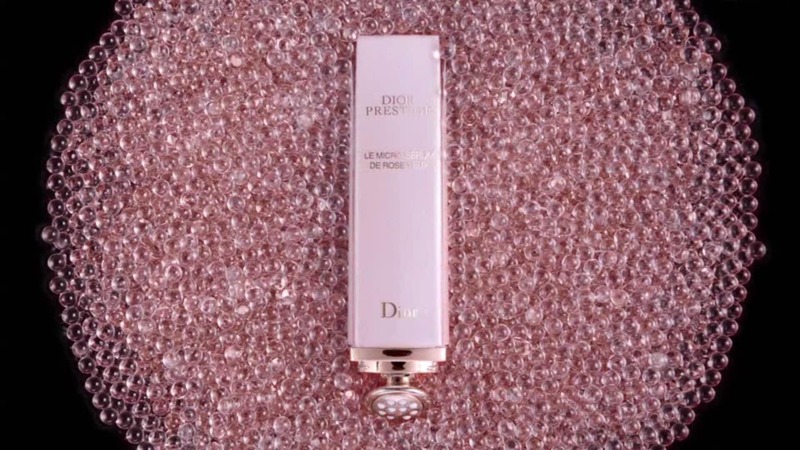 To complete the effects of Le Micro-Sérum de Rose Yeux, Dior Science has created a one-of-a-kind applicator* with a filed design. ** Its 10 ceramic micro-beads with 360° rotation are integrated, for the first time, into a massaging head gilded with fine gold. This one-of-a-kind applicator* offers a boosted micro-massage, in particular on areas of puffiness. ** In China, South Korea, Hong Kong, Japan, Singapore, Taiwan, Thailand, the European Union and the United States.